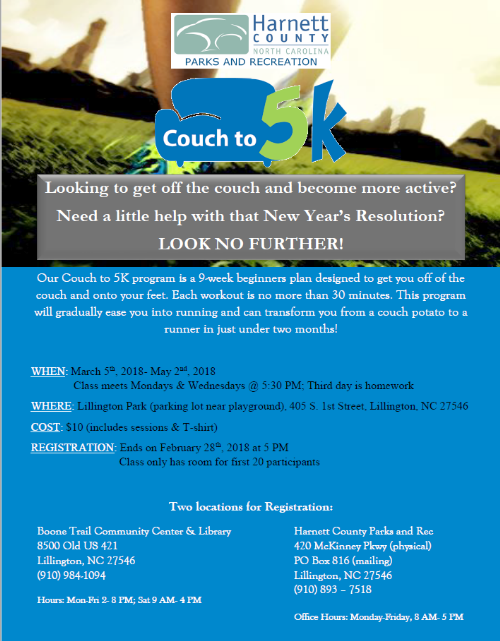 Looking to get off the couch and become more active? Need a little help with that New Year’s Resolution? Our Couch to 5K program is a 9-week beginners plan designed to get you off of the couch and onto your feet. Each workout is no more than 30 minutes. This program will gradually ease you into running and can transform you from a couch potato to a runner in just under two months! The class costs just $10 (includes a T-shirt) and meets two days a week at Lillington Ball Park at 405 S. 1st St in Lillington. See flyer for full details. You can contact Drew Bryant at (910) 814-6392, or at wbryant@harnett.org for more information.